The number of people offered places at UK universities has now hit a record 442,900 – 3% up on 2015, official figures show. Around 19,000 of those have had their university and college places confirmed since midnight on A-level day, says the admissions service Ucas. So far, over 14,000 have been accepted through clearing – 52% up on last year. Association of Colleges Chief Executive Martin Doel urged people to take time to choose the right course for them. A decline in the number of 18-year-olds and the removal of the cap which limits university places in England have contributed to “a buyer’s market” in university applications. Ucas says clearing, the system which matches unfilled places with would-be-undergraduates without offers, opened two hours earlier than usual on results day with more places on offer. And some leading Russell Group universities have been making greater use of the system. Bristol University said places were being filled very quickly, adding that the newly competitive environment meant that “like all universities, we make use of clearing in ways that we wouldn’t have a few years ago”. 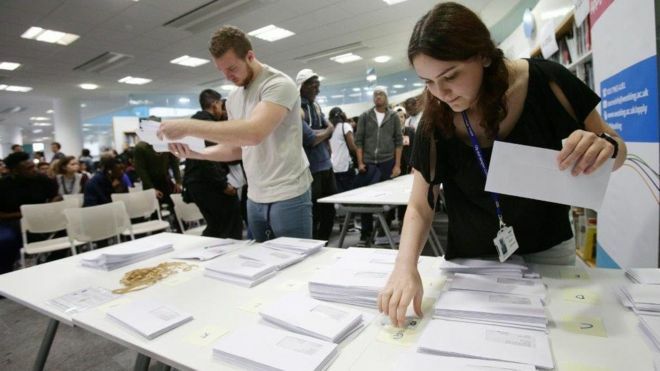 Birmingham University, which filled all its places on Thursday, said it had been “inundated” – with more than 6,000 calls for the small number of places available. Ucas says high numbers are likely to be accepted through clearing over the weekend – with the majority of applicants using this route expected to find places by the end of Monday. More than 153,000 people are still eligible to apply through clearing, says Ucas. Mr Doel said young people should also consider “more affordable education and training routes available that can lead directly to a career” including higher level technical and professional courses and apprenticeships at further education colleges. “Not only are tuition fees less at a college, living and travelling costs are also much lower because it’s possible to stay at home,” said Mr Doel. The final date for university applications this year is 20 September.